It’s a baby, a little, little baby. How sweet. How cute. What potential! In Greek, the word is brephos, which can either mean an unborn child or a newborn child, but interestingly enough, this word is gender neutral. As a result, this is the same word that is used for the baby that Elizabeth carries in her womb and “leaps for joy” when Mary came to visit [Luke 1:41], along with six other references. And my favorite reference is in I Peter 2:2, where brethos is used to describe young believers who should crave “spiritual milk,” and cast off the food of the world. But I’m getting off track. I wanted instead to talk about a baby’s potential. You see, from the outside in, we do not know what is in store for every baby we see. Facebook is filled with pictures of babies, taken by proud parents, who are full of hope and expectations for their baby. They want to give this baby the best of everything, the opportunities, the nourishment, the foundation. They love this baby so much. And yet, how many mothers collapse in grief when their child becomes a murderer or a drug addict or an abuser? How did this happen? What happened to all that potential? A baby depends on the “village” around him/her to grow and become. If we succeed, if God’s intent is encouraged and prevails, we have a saint. But if we fail that child, what then? And who’s this little fellow in his itty-bitty robe? 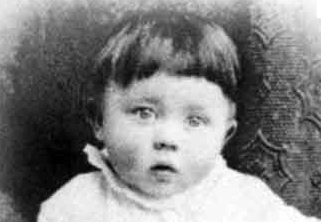 That’s tiny baby Adolf, the Hitlers little boy! Will he grow up to be an LL.D.? Or a tenor in Vienna’s Opera House? maybe to the Burgermeister’s daughter? Knock knock, who’s there, it’s Adolf’s heartchen knocking. No one hears howling dogs, or fate’s footsteps.